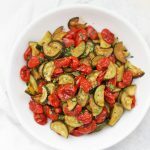 Simply Roasted Zucchini and Tomatoes – This simple veggie medley makes the most of summer produce. My favorite method + half a dozen delicious variations below! Originally posted January 2014. This recipe (including photos, post, etc.) has been updated from the archives. Scroll down to see the new video! Summertime is the BEST produce time! Everything good is season it seems–peaches, berries, corn, tomatoes, and–of course–zucchini! First off, this is 100% a method rather than a specific “you better follow these directions exactly, or else!” recipe. It’s a simple, tasty combination that I love for breakfast, lunch, or dinner. This pairs great with any simply cooked meat for dinner, or you can stir it into some pasta or quinoa for a quick dish. I love it paired with eggs for breakfast or a quick dinner. Sometimes I add an onion or a bell pepper, or I change the seasoning blend. Have a bit of a fresh basil or cilantro on hand that you need to use? Toss it in! It’s also a GREAT use for my olive oil and herb bombs–pick any flavor combination and the end result will have amazing flavor! Let’s talk herbs. Zucchini and tomatoes are kind of a blank slate in the flavor department. They pair beautifully with basil, cilantro, dill, and more! Flavor boost. Similarly, this is really yummy with any of the flavored olive oil and herb combinations I shared in my olive oil and herb bombs post. I LOVE using them in these. Lemon and dill is delicious, rosemary is awesome, and I always love roasted garlic or a little kick from chile oil. Switch up the veggies. Sometimes I add a chopped onion, yellow squash, or a bell pepper or two. Anything that’s starting to look a little sad! Don’t rush it. Part of the beauty of this dish is that the tomatoes get kind of caramelized the longer you put them in the oven. I LOVE the flavor that adds, so I don’t like to rush things. What do I serve this with? Anything! This is great alongside fish, chicken or beef. I’ve also tossed it in with pasta and quinoa more times than I can count. It’s amazing with scrambled or poached eggs, etc. 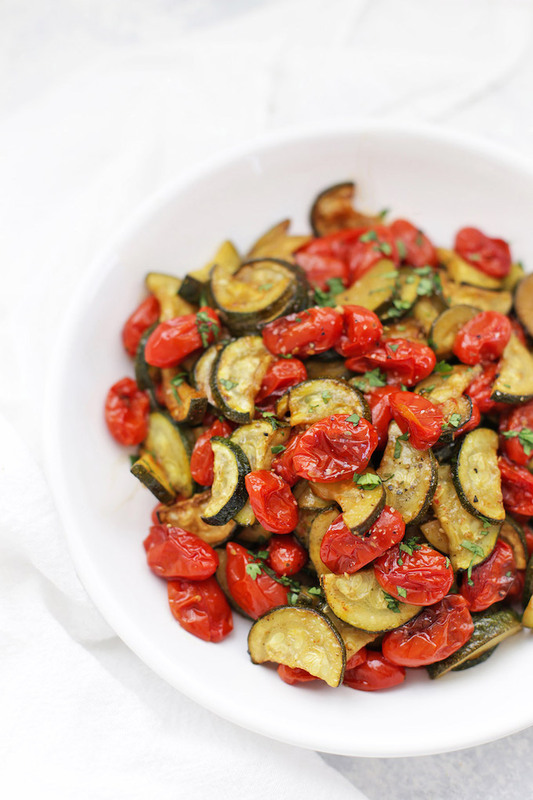 This is such an easy summer side dish! Below is my basic method. See the notes for lots of variations! 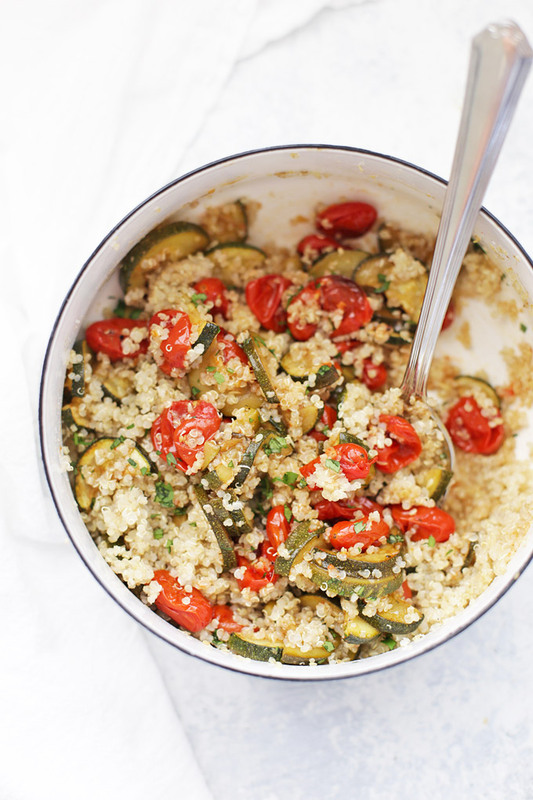 In a large bowl, toss zucchini and tomatoes with a drizzle of olive oil and stir to coat. Stir in balsamic vinegar, and add a generous sprinkle of salt and pepper. Fresh herbs: after roasting, stir in 1-3 Tbsp of basil or cilantro. Dried herbs: add 1/2 tsp onion powder, 1/2 tsp garlic powder, and 1/2 tsp oregano to the vegetables along with the salt and pepper. More veggies: add 1 diced onion, or 1 diced bell pepper, or 8oz of halved button mushrooms (or any combination!) to the mixture. Old Bay: add 1/4-1/2 tsp Old Bay seasoning to the vegetables before roasting. This looks lovely and I love the idea of making batches! Can I ask what is probably an obvious question? If you make a batch a week, I guess you keep it in the fridge but how do you then reheat it? My brain doesn’t want to kick in to gear this morning! No worries! I refrigerate the leftovers, then I reheat them in a pan with eggs, or even use a microwave in a pinch. Hope that helps! It does thanks! My brain did eventually start working again this afternoon 😛 We don’t actually own a microwave… It is a pain sometimes! 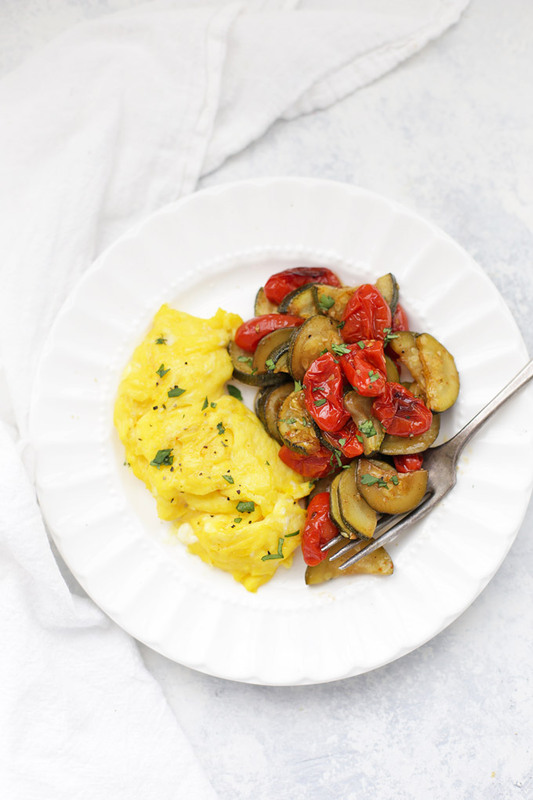 Zucchini and tomatoes – yum! I’m always looking for healthy side dishes. Thanks for posting this! It’s as delicious as it is beautiful! I loved it this week and am going to be making it this weekend ! Finally got around to trying this recipe. This is a winner! DH ate two helpings, and he is not a big fan of vegetables! I made the recipe just as written, with no additions – it’s perfect as is. Next time, I think I’ll add mushrooms, just to change things up. By the way, I bought a new (to me) brand of balsamic, Star Balsamic Vinegar of Modena. I found it at Tom Thumb grocery. I read an article comparing brands, and this one got high marks for taste and value. It is really really good! Can you can this recipie? Jeannine – I wish I knew! Canning is not one of my strong points. I’m sorry! We do a similar thing, and throw in some black beans and eat over rice. Love the roasting idea! Ooh yum! That sounds delicious! This is one of our very favorite veggies dishes! This looks amazing! One of my favorite veggie combos in the summer–yum! Liz – I haven’t. 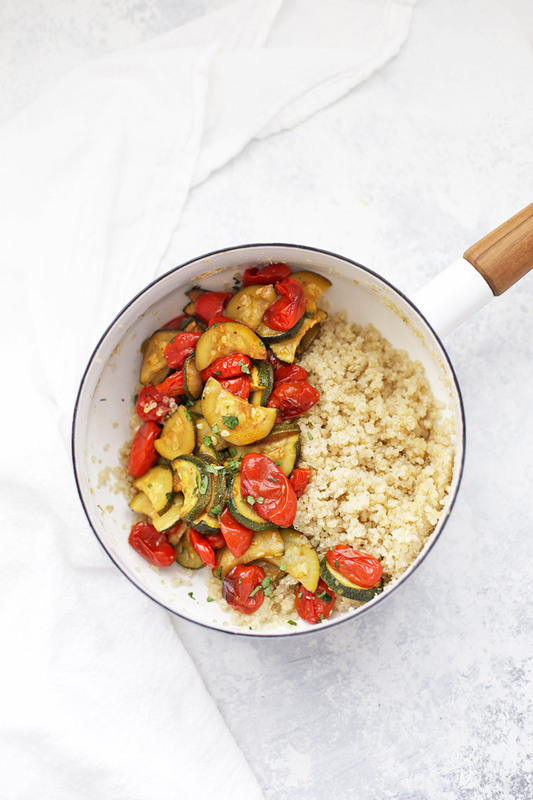 I do know that zucchini tends to lose a lot of its texture upon thawing, but if they’re mixed into something like eggs or quinoa, that might not bother you too much. Can I sub the balsamic vinegar? With what? Madonna – I’ve never substituted it in this recipe. It’s primarily there for a little acidity and a tiny touch of caramelization. If you can’t eat it or don’t tolerate it, you could probably use a squeeze of lemon juice, but the flavor will be a little different and you won’t get the same caramelization. I’m not crazy about the skin of the tomato peeling when roasting. Does this bother anyone but me? Mary – I actually love it. 🙂 I love the contrast of the caramelized exterior with the tender interior. 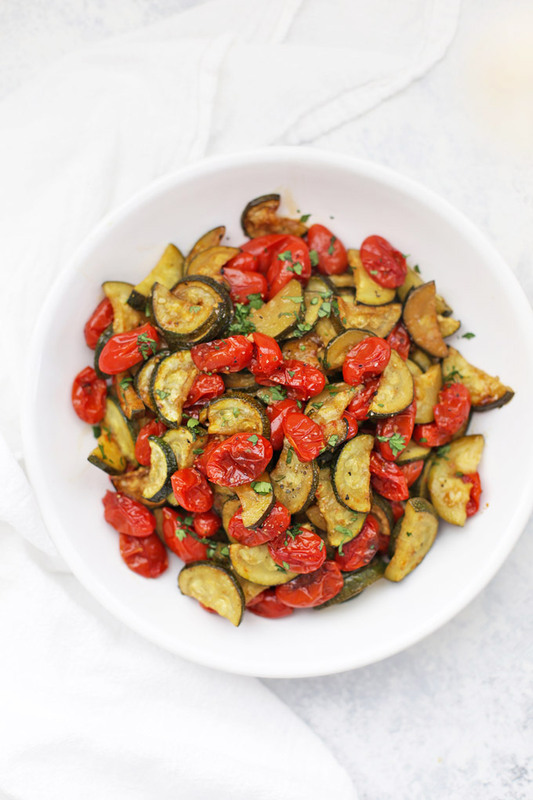 You may prefer a roasted veggie blend without tomatoes, like this one, perhaps? This is as good as it looks. I was looking for a little inspiration for something to feed my health crazy calorie wise wife on a special occasion, and this proved so good she asks for it on a regular basis now. I have toyed around with everything from lemon/cilantro to roasted garlic even a little honey. You just can’t screw it up. As the author says, don’t rush it. Letting those tomatoes caramelize is the icing on the cake. WOW! I’m so glad you enjoyed them. Thank you so much for taking the time to share a review! What kind of tomatoes do you recommend for this recipe? Cherry, Roma, Heirloom? How thick should I cut the zucchini? I was telling my husband about at his type of fish my mom made, she added mozzarella cheese to a tomato and zucchini dish. Could you add cheese to this dish? And when would you add it if you did? Theresa – I’m sure you could! I’d probably add it near the end so it doesn’t burn. Maybe with 5-10 minutes to go?